The Castle Pines Village Lakes Fitness Center caters to all, opening at 4:45 a.m. every morning. Invariably, one finds the usual crew there pounding the machines and fighting a losing battle with Father Time. Their unofficial leader and chief conversation officer is Roger Dunker. Some call the group “Roger’s Roosters.” Those happening by early, knowing neither the regimen nor participants, would often become engaged in the banter as Roosters told it like it was ... or should have been. So it was that first morning many months ago when young Canadian Angela Williams found herself in the middle of the ususal morning conversations. But she was uncommonly different from others, as discussions quickly revealed. Indeed, the Roosters learned this demure (5’1”) woman was also a mother of three children and a marathon runner. She was diligent and efficient in her workouts and she exercised early to finish with enough time to wake her children in time for school. Angela became a bit of a legend to many, having been introduced to the art of running 16 years ago by a 60-year-old friend of her mom’s, Don Mullin. A 10K race in Toronto in 2000 had marked her more formal beginnings. As life continued to “happen,” Williams quit her teaching career when husband Jason’s software career relocated the family to Colorado and ultimately Castle Pines Village. Meanwhile, Angela moved into longer distance running and eventually marathons while her family was still growing. 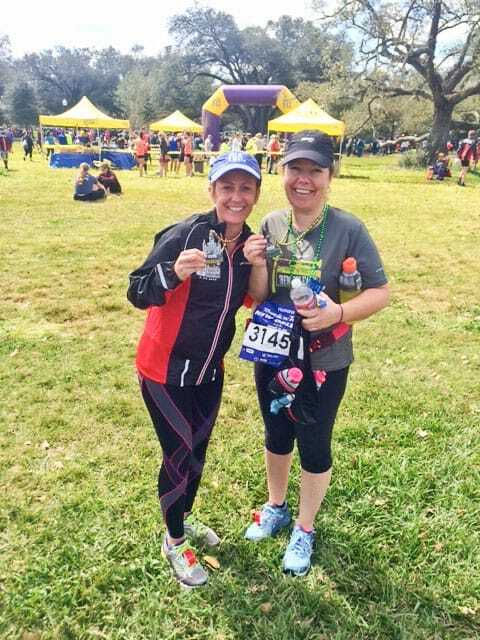 Angela Williams (left) swilling the moment with her friend and fellow marathon runner Lisa Malenfant. Having run five marathons over the years, each contest represented a personal goal: to recondition herself after the birth of her three children (Abigail, Dean, and Blake) or to accompany Don Mullin at age 70 in Prague in 2010. Back to the Village. Angela fell under the spell and friendship of the morning crew. What a gift she proved to be and they to her as well. Now the guys had something tangible to which they could contribute wisdom and support, and daily encouraged Angela to reach her dreams. Prior to meeting and unofficially joining the fitness group, Angela’s personal best marathon was 4 hours and 17 minutes. A remarkable time for her age already, the gang came to urge her on with loftier goals, convincing Angela she could do her next marathon in under 4 hours. The New Orleans Rock ‘n Roll Race to be held on February 28th became the target of opportunity and the rest of the story. Jason’s faith in her and Angela’s own focus, determination, and persistence became the critical inputs. When the race finally ended, Angela had posted a time of 3 hours and 50 minutes, bettering her previous record by almost half an hour. Among other women, she placed 119 out of 1,963 runners and number 20 of 364 females in her age division. Roger remains convinced today that because of her short legs, she took twice as many steps as most competitors. The jury is still out on this, and at the Village Fitness Center conversation about it will go on interminably. Angela Williams shared a special embrace with her number one supporter, husband Jason, following the New Orleans Rock ‘n’ Roll Marathon. Both completed the race and bettered their previous race times. The City of Castle Pines administrative offices will relocate to inside the Castle Pines Library (see related story next page) effective April 1. City offices will be closed on March 31 during the move. Along with accommodating city offices, the facility will provide a new regular location for city council meetings, which are currently held at the community center. Beginning with the April 26 meeting, all future city council meetings will take place in the community room of the public library. City council will continue to meet on the second and fourth Tuesday of every month at 6 p.m. The development of the new Castle Pines Library and city administrative offices is the result of a partnership between the City of Castle Pines and Douglas County Libraries. The City of Castle Pines donated the land; Douglas County Libraries has built and will own and operate the 15,000+ square-foot building. The new library, located at Village Square Lane and Village Square Terrace, will not be open to the public until later in April. Fact not fiction – the new library in Castle Pines opens in April. Saying farewell to the old library location will be a melancholy yet upbeat occasion as Douglas County Libraries gets ready to open the first of three new libraries in Douglas County. At 4 p.m. on Friday, April 8, with a registration-only program, “Goodnight Library” will be a celebration full of fun for the community. Join in for a light snack, special storytime for kids, crafts, and a farewell to the building. Pajamas are encouraged, but not required. The new library is incredible beyond words. With more than 13,000 square-feet of library space on two floors, patrons can enjoy perusing the state-of-the-art library. The first floor has the adult and young adult collections, plus a lounge area complete with laptop vending. Vending is done via a machine and is self-serve check out of a Mac or PC laptop for use in the library only. Some space on the first floor will be dedicated for use by the City of Castle Pines. Amazing views of the Front Range can be seen from the northwest corner of the second floor outdoor patio. Furnished with Adirondack chairs and small table and chair groupings, the patio features a covered area for shade. The second floor will house media and children’s collections. Another remarkable feature is a fireplace in the protected southeastern corner. The library has a drive-through book drop, a community event space, three public conference rooms, a study room, and a dedicated storytime and kids’ area. Grand opening festivities of the new library will be at the new location at 360 Village Square Lane on Thursday, April 21 from 10 a.m. to 7 p.m. The Ribbon Cutting will take place at 10 a.m. and a family kickoff at 4:30 p.m. No registration is required and the more, the merrier. For those who are not able to attend the grand opening celebration, there will be more surprises on Saturday, April 23 – including special storytimes at 10 a.m., noon and 2 p.m.
For information about Douglas County Libraries visit www.douglascountylibraries.org. Excited to join the neighborhood, the congregation from Journey Church gathered on the vacant property with Pastor Scotty Priest (inset with wife Amy) to pray and bless the land. Four bus loads of Journey Church’s Centennial congregation paid a visit on March 6 to the church’s new 12.6-acre lot located at 9009 South Clydesdale Road between the Surrey Ridge and Oak Hills neighborhoods in unincorporated Douglas County. The church purchased the land in 2015. Excitement was evident as individuals and families disembarked from the buses and trekked around the old ranch property. Many were amazed at the beauty of the location and one of the first things the kids did was run over to the drainage pond to look for critters. The parishioners hail from Parker, Bailey, Highlands Ranch, Aurora, Castle Rock, Englewood and Centennial. Families with young children and infants, elementary school kids, and teens joined together with older individuals and couples to celebrate and pray at the building site. Crystal, a young woman who attends Journey Church noted “You cannot find more respectful and generous individuals than those who attend this church. It is a wonderful atmosphere and ministry.” A boy skipped, smiled, and yelled to his family, “Well, this is our church folks.” The boy’s father said his son loves going to church. “The children’s and teen’s programs are great and the atmosphere is too. Our pastor’s messages are relatable.” Another young father added that his family has built solid friendships within the Christian-based church community and enjoys being involved in it. Last month the Castle Rock location of Journey Church closed. The plan is to merge the two congregations at the Centennial location. This combined group of parishioners will attend the new Journey Church when it is completed. The church’s website noted the total cost of the project to be $5.5 million with the aim of raising $2 million with the BUILD Campaign. The timeline for completing Phase 1, a 14,250 square-foot two story building that includes a 350 seat auditorium is spring 2017. There will be classrooms, a nursery, toddler room, and gathering area on the lower level. To learn more, visit www.journeycolorado.com. For information about the BUILD Campaign visit http://buildjourney.com. Journey Church congregation visited the 12.6-acre lot where their new church will be built. They were pleased with the location and look forward to building relationships in the community. Based on research done by Zippia, a career resource website, the City of Castle Pines is the second smartest city in Colorado. Castle Pines earned its second place ranking with virtually zero teenage high school dropouts and just 1.5 percent of the adult population lacking a high school diploma. In addition to impressive high school graduation rates, Castle Pines residents boasted higher than average secondary education rates, nearly 67 percent of residents having earned bachelor degrees or higher – that’s two times the national average, and 24 percent having graduate or professional degrees. According to the Zippia article, the smartest places in Colorado were determined based on the percentage of adults with at least a high school education and the percentage of teenagers who were high school dropouts. Only communities with more than 5,000 people were considered. This data was pulled directly from the latest American Community Survey from the U.S. Census. The number one spot was awarded to the Town of Estes Park and the City of Louisville was ranked third. The full rankings (including where neighbors Castle Rock, Lone Tree, Parker and Highlands Ranch landed) and methodology used can be viewed at www.zippia.com/advice/smartest-cities-in-colorado. 2014 was a pivotal year for Castle Pines resident Tod Baker. Baker had worked for more than 20 years in the healthcare industry, and he took a leap of faith and started his own business in which he would provide a better solution for physicians and hospitals to improve performance. Baker’s company MDValuate has been very successful and in February his company was recognized by Governor Hickenlooper and other Colorado leaders at the Innovation Pavilion’s inaugural Innovation Awards. Cancer has touched most of us in some way, and we are all aware of the toll that this disease takes on the bodies of those who are undergoing treatment. LifeSpark Cancer Resources is a local Colorado nonprofit that provides support services for those with cancer, and residents of Castle Pines are on both the giving and receiving end of this wonderful organization. LifeSpark is made up of a group of volunteers who among other things, provide Reiki and Healing Touch therapies at approved facilities or in homes when patients are home-bound. Kristin Adams owns two Elements Massage locations in Castle Rock and is thrilled to be working with LifeSpark. “We are proud to be one of the few studios in Colorado to open our doors to LifeSpark so that these patients can have a pampering, relaxing and life-changing experience that does not take place within the walls of a hospital or clinic,” stated Adams. Suzy Kesler, who also lives in Castle Pines, owns a mobile medical massage practice called Heart-Felt Healing which specializes in oncology. Kesler has volunteered with LifeSpark for the past three years and provides both Reiki and Healing Touch to support cancer patients. LifeSpark offers its services free of charge and counts on donations to continue to provide these services. Their annual fundraiser will be held on April 23 at the Ritz-Carlton Hotel in downtown Denver. To learn more about LifeSpark or for information about the fundraiser, visit www.LifeSparkNow.org. The Castle Pines Arts & Cultural Foundation (CPACF) hosted a young musicians showcase featuring Hank Troy Jazz Trio on February 26 at the Daniels Gate clubhouse. The simple and elegant evening event is one of the many ways the CPACF raises money to help provide elementary school music scholarships to those in need in Douglas County. According to Vicky Kellen, board member for the CPACF, numerous students continue music education in middle and high school and many go on to study music in college, some even planning to make careers as professional musicians and music educators. “All student participants benefit from the joy of making music and its power to enrich their lives,” shared Kellen. To learn more about the CPACF, visit www.castlepinesarts.org. Gina Gerken, a raptor enthusiast and bird handler, enjoys the company of a non-releasable red-tailed hawk. Castle Pines Village resident Gina Gerken is passionate about birds. Since the fifth grade she has studied, drawn, counted, monitored, fed, and flown birds. Gerken has turned her enthusiasm into educating all age groups about birds, more specifically, about birds of prey – hawks, falcons, eagles, and owls. Handling hawks in well-known outreach programs for several years, Gerken has awed audiences with raptors and her knowledge of the natural world. Presently, Gerken is involved in Nature’s Educators, an educational wildlife organization that connects people to wildlife and the environment. With its 22 non-releasable raptors and numerous outreach programs, her current responsibility has shifted from handling birds to fundraising. 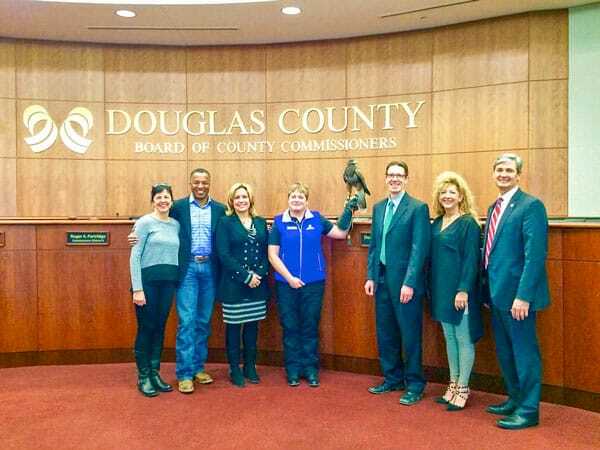 Devin Paszek of Nature’s Educators held a raptor with some of the Douglas County Commissioners and Cherokee Ranch & Castle Foundation members. The Cherokee Ranch & Castle Foundation has generously agreed to provide a new home for Nature’s Educators wildlife facility on Cherokee Ranch property with the approval of the Douglas County commissioners. 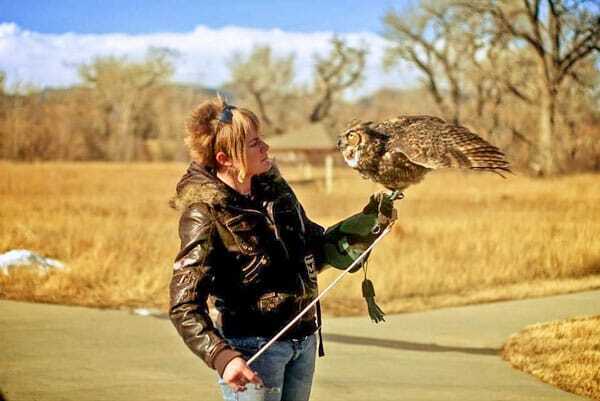 While Nature’s Educators will continue with its birds of prey outreach programs throughout Colorado, the organization will also partner with the foundation to offer wildlife programs and lectures at the Cherokee Castle. The temperature-controlled facility will house raptors, reptiles, amphibians, and invertebrates in brand new, beautiful enclosures. There will be a supervised medical facility, an on-site laundry, volunteer lounge, staff offices, a huge food prep room, and much more. Advice from the avian vet will also be offered to assure the birds’ well-being. Gerken is very active in Castle Pines Village where she is the “go to” person when questions come up about animal behavior. Several years ago, the Castle Pines Village Homes Association neighborhood residents, including Gerken, established a wildlife committee in the Village. For the past five years she has served as the organization’s chairman. The committee has placed 69 bluebird boxes on a trail throughout the area and closely monitors them. They also give presentations at “Coffee, Tea and Wildlife” talks that are held in the neighborhood. For more information about Nature’s Educators, visit www.natureseducators.org. To learn more about birds, visit www.denveraudubon.org. Skylar Tartz, a Rock Canyon High School junior and Castle Pines Village resident, modeled Chanel at the Grand Palace in Paris during fashion week. Tartz also traveled to New York for her runway debut representing top designers, including Victoria Beckham (left inset) and Tory Burch (right inset), among others. While many high school students were taking a vacation from academics and enjoying some time off during spring break, Rock Canyon High School junior and a Castle Pines Village resident Skylar Tartz spent her break catching up on all the school work she missed while modeling in New York and Europe during fashion week the past few months. Fashion Week is an opportunity for the industry’s top designers to present their upcoming collections in a series of runway shows and presentations to buyers and the media. It takes place twice a year in the major fashion capitals of the world: New York, London, Milan and Paris, and it is a coveted accomplishment for any young model to land. Tartz, Elite Model Management New York’s newest recruit, made her runway debut in a key opening slot as a semi-exclusive at Victoria Beckham and had an impressive show list with appearances on the runway for Calvin Klein, Burberry, Versace, Alexander McQueen, Tory Burch, Chanel and Dolce & Gabbana, to name a few. In addition to modeling, Tartz’s other interests include travel, music, art, and photography. Being in New York and Europe presented many options to pursue those interests. Mom Karla said that Skylar really wanted to visit the Louvre and Eiffel Tower in Paris and the Duomo in Milan. “One of her favorites was an orchid exhibition at the Jardin des Plantes in Paris,” she said.